In the modern machine-built age most people have forgotten the art of leathercrafting, but a few hardworking people still practice and support it. 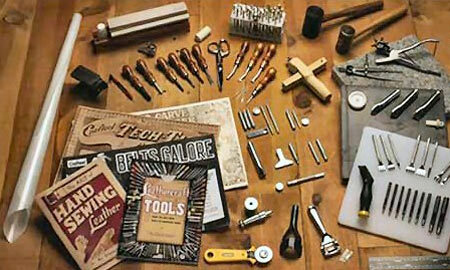 This set of starter tools provides a solid entry point for those rugged folks who’d like to give it a go. Around 17 or 18, the age when most kids trade in their model cars for real ones, they also put away their hobby knives in exchange for shiny mechanic’s tools. But if you ever want to rejoin the model crafting ranks, you can grab a full set of hobby knives for less than you’d pay for one of the old Revel models you used to put together with ’em. 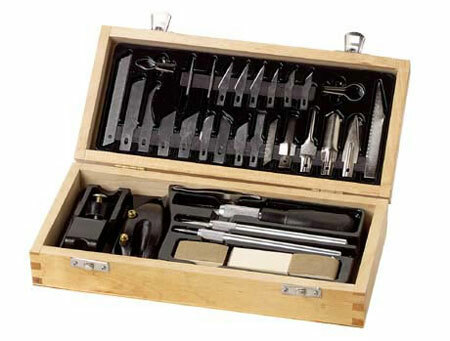 Northern Tools sells this 35-piece set of hobby knives and blade attachments in a nice wooden box for $10. The set includes three different handles, two saw blades, six shaping blades, 17 cutting blades, three awl points, an edge trim guide, tweezers, a mini-planer, and a sanding block — you know, all that stuff you used to ignore when building models as a kid. If you want to showcase your special photographs or artwork, you can put ’em in a custom frame — but driving the glazing or framing points that hold the backing in the frame can be a challenge. Hammers are too difficult to swing on frame backs, and framing pliers never seem to push the point the way you want. Fletcher’s FrameMaster eases this frustrating task. Some materials just don’t want to cut nicely. Foams can create irritating chips that stick to everything, and nylon ropes and polyester fabrics like to fray after cutting. For these materials, you need a hot knife — it can cut through foam, nylon ropes, and poly fabrics easily. If you’d rather not use a homemade rig made out of wire and a rheostat, Hotwire Direct offers this commercial solution for cutting foam. 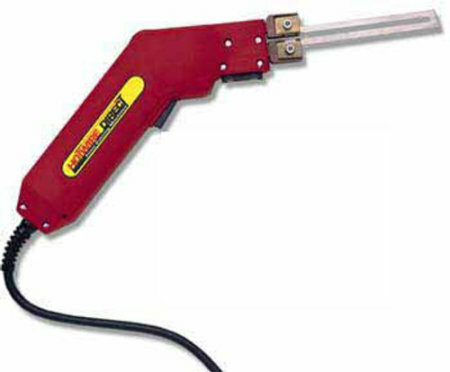 Their handheld hot knife can reach working heat within five seconds of turning it on. 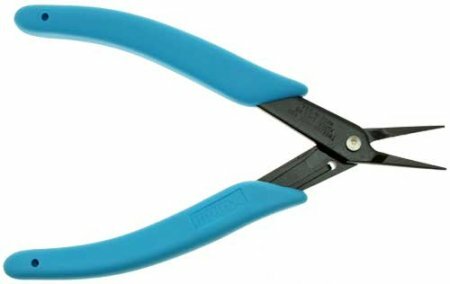 With 16 different temperature settings, you pick the best temperature to slice through foam or to fuse nylon easily, and the circuitry inside prevents the tool from overheating. 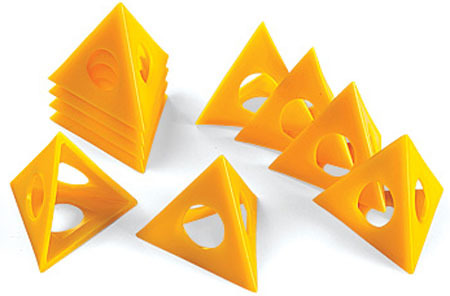 The blades provided are designed to take the heat without warping over time, but if you want some variety you can add the groove sled to cut different profiles in foam. Hotwire Direct’s hot knife runs $244, so you if you only need to do a little foam cutting, you may be interested in making your own. If you want to see some of Hotwire Direct’s tools in action, check out this video of hot knife sculpting (.wmv) and this awesome clip of their hot wire CNC machine (Youtube). 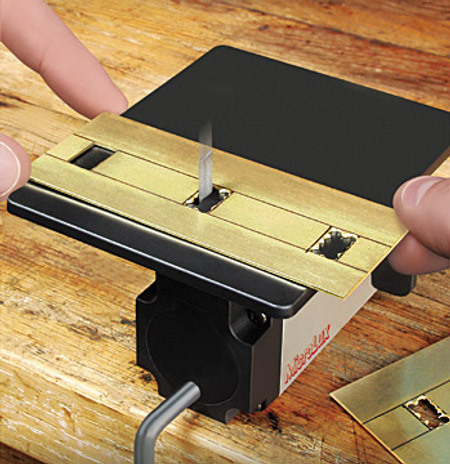 Microlux, maker of miniature tools, has come out with a filing machine. It won’t help with your taxes, but it’ll take the tedium out of filing metal, resin, plastic, or wood. Though filing machines are usually heavy dudes, Microlux has made one for the serious hobbyist. The tool works like an inverted jigsaw, but with a file instead of a blade. 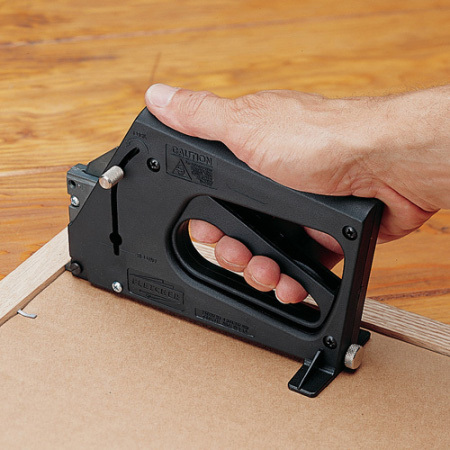 The machine cuts only on the pull stroke and only on stock up to 3/8″ thick. Just clamp it to the edge of your bench and begin filing. I’m a big fan of the folding type of utility knife that Superknife is known for. If you’re hard on knives or don’t want to worry about losing a family heirloom, they’re great knives to keep in your pocket — however the standard utility knife blade isn’t exactly a precision instrument. 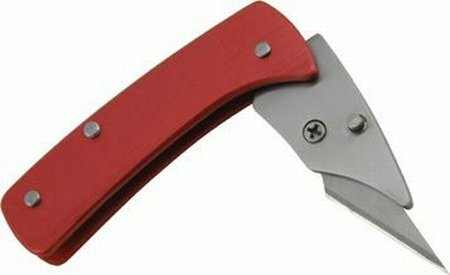 Fortunately, Superknife offers a smaller exact…..I mean folding hobby blade knife for those who often need to make finer cuts. 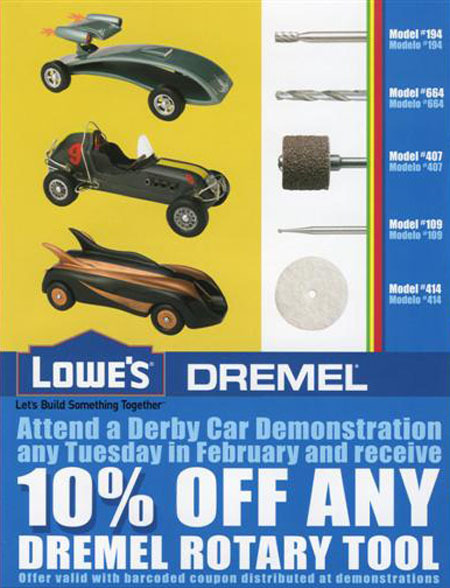 If you or your children are interested in crafting small derby cars, head to Lowe’s on Tuesday for a free demonstration. After they show you how to make a derby car faster and more aerodynamic, your kids’ll get an attendance badge, and you’ll receive a coupon for 10% off Dremel products. See more details after the jump. 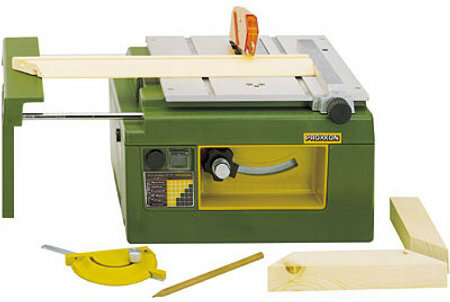 Proxxon’s FKS/E table saw may look like a toy, but it’s a fully functioning miniature table saw. When you’re making a scale model, a tiny error can be like flubbing a cut by a whole inch at full scale. To help model makers make exact cuts, Proxxon has been building precision power tools like this one for 30 years .